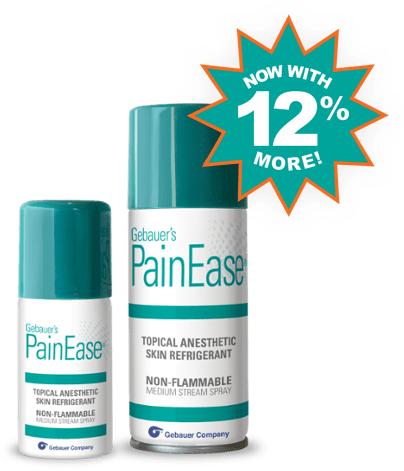 Gebauer provides industry-leading topical anesthetic products to improve the patient experience and increase satisfaction. Temporarily control pain associated with IV starts, vaccinations and other needle and minor surgical procedures. Now with an exclusive application, ideal for sensitive patients. Patient Comfort Solutions™ - From hospitals to private practices, learn how doctors, nurses, and administrators use Gebauer topical anesthetics to improve patient comfort. Increase efficiency and boost HCAHPS scores with our patient comfort solutions. Reduce patient anxiety and gain a competitive edge with instant topical anesthetic sprays. Increase the impact of your patient comfort processes and investments. Family owned and operated for over a century, Gebauer Company has remained on the forefront of patient comfort and topical anesthetic technology and advancement. From the front lines of two world wars, to the White House and to your hospital’s shelves, learn the journey that’s made Gebauer the most-trusted name in patient comfort for over 100 years. "My patients are especially thankful for dedication to excellence in order to put them at ease during an especially stressful time. As a Certified Registered Nurse Anesthetist, Pain Ease has allowed me to accomplish this successfully." "Our patient is always our chief concern. But as you know, no margin - no mission, so weighing cost benefits is an important part of a nurse manager’s job. The issues to consider regarding Pain Ease are the costs associated with failed IV starts, the decrease in time nurses spend calming anxious patients and the increase in patient satisfaction. Higher patient satisfaction translates into higher HCAHPS scores." 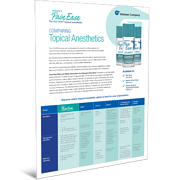 Learn which topical anesthetic is best for your organization by comparing price per dose, onset time, and much more.